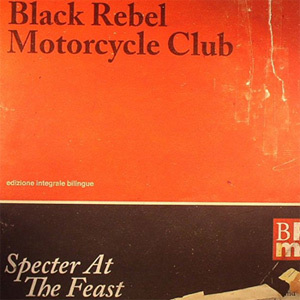 As many people know, this is the first Black Rebel Motorcycle Club album to be released since bassist Robert Levon Been's Father, Michael Been, died of a heart attack in 2010. Been's father was the singer of 80s band The Call and what better way to pay a tribute than to record a cover of the band's most prominent hit, Let The Day Begin. It is an ideal way to pay tribute to a father and musician. Been senior was also often referred to as the unofficial fourth member of the band. Not only is Specter At The Feast a triumph for its content, it is also a triumph that it was made after having suffered such a loss. The album manages to encompass all the sounds BRMC have demonstrated on previous albums since their 2001 self-titled debut. Specter At The Feast begins with the slow burning Fire Walker which sets the mood for the rest of the album. But that does not mean to say that this album is a sombre listen. The BRMC sound that everyone recognises is still there. One of the highlights on Specter At The Feast is Teenage Disease. It sounds like nothing but unadulterated filth and it's brilliant. There are few bands that have a swagger in their sound like BRMC, and Hate The Taste sums that up with those scuzzy guitars and driving choruses. In summing up Specter At The Feast, it was made by a band in mourning, but it is a great album to add to the band's body of work. In a similar vein to Feeder's 2002 album, comfort in sound, made after the death of drummer Jon Lee, it is a tragic shame that something so special is born out of sadness. Black Rebel Motorcycle will always be welcomed by those that want real music with fire in its belly.